Sunday Best: It's A Girl! Wow! What a surprise! We were completely wrong in guessing that our baby was going to be a boy. But we couldn't be happier! I'm hoping I will get to share more photos and details soon. Right now, however, I'm going to snuggle this baby girl fresh from heaven and savor every second. Congrats!!!! I'm so excited for you! Enjoy her!! I'm a bit biased, but baby girls are the best! 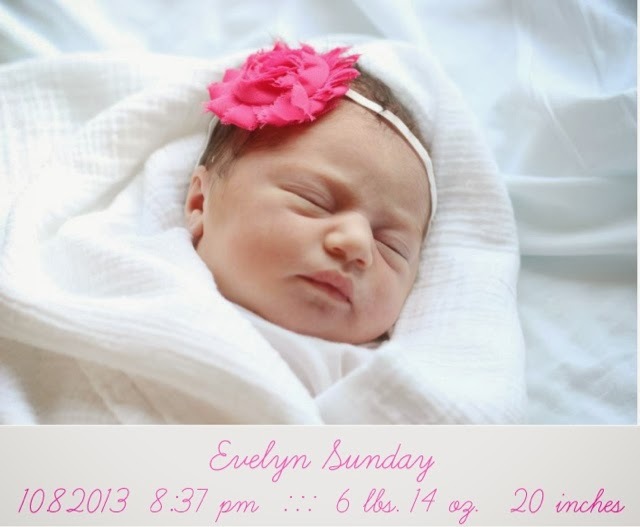 ;) Enjoy Evelyn! CONGRATS!! She is adorable. Enjoy the snuggles!! .....and I just KNEW it ;) hehe. So, so precious! I hope everything went well. Congratulations!